“Welcome everybody! Thanks for joining me as we discuss a favorite topic of mine and probably yours as well- food at the Walt Disney World resort. Ok..Ok…Let me elaborate because there’s food everywhere you turn in the theme parks. 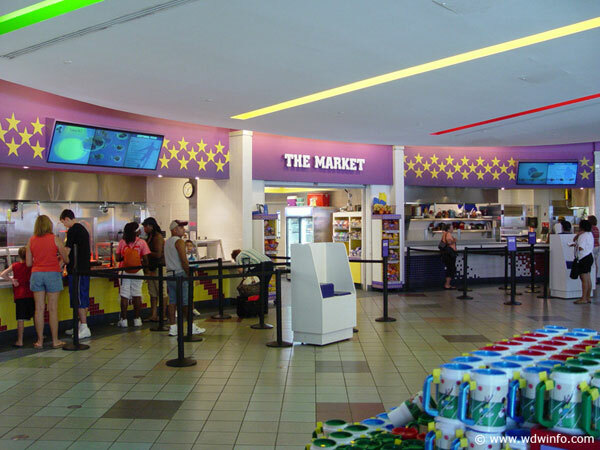 Let’s talk about quick service food at the various resorts on Disney property. If you’re like me there are times when you get a craving for a snack or entrée at one of the many quick service locations at the Disney resorts. It would have to be a big craving because getting from one Disney resort to another can sometimes be a challenge, especially if you don’t have a car at your disposal.” Continue through the page break and let’s look at some of our favorite delectable Disney World resort foods. Tie Dyed cheesecake at Disney’s Pop Century Resort Everything Pop food court – $3.59 “Aww yes, a food that coincides with the theme of the resort. A nice choice sir. Who could argue how well tie dye meshes with the decades of the Pop Century Resort. This cheesecake is not “off the charts” delicious, but enjoying it inside the boundaries of the Pop Century Resort food court makes it taste a little better. Oh! And don’t forget, you can save 20% by using your Tables in Wonderland card. That’s icing on the “cake”. “I know a lot of you still have some quick eats you want to mention. Please write them on a piece of paper and drop them in the box labeled “Quick Eats Honorable Mention” as you exit the room, or simply add them to the comments section below, or on the official DIS Facebook page”. The next time you are sitting at your home resort at Walt Disney World and you are hit by a food craving from another resort across property don’t hesitate to get up, map out your journey, and visit a resort where you’ll find one of your favorite foods. After all, the entire Walt Disney World resort is open for you to enjoy. This includes the other resort hotels. In most cases the food at the resorts taste better than the food inside the theme parks. You’ll be surprised what you’ll discover when you visit the several resort quick eateries across property. Friend Aaron on Facebook: I accept reader friend requests. Extra Magic Hours: Pixie Dust or Bust? A Brief Analysis of Walt Disney World Quick Service: Is It Really a Steal?